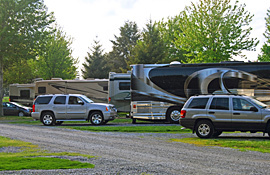 At Pine Hill RV Park, when we say that we’re big rig friendly, we mean BIG RIGS! We are prepared to handle the largest motorhomes, travel trailers and fifth wheels with full hook-up sites that include 50-amp service and cable. Most of our sites are pull-thrus and can easily accommodate multiple slide-outs and any length of RV. 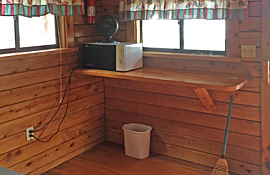 We cater to this type of camper, and we will go out of our way to make you feel welcome. There is no reason to camp elsewhere. If you have made a major investment in your equipment, there is no reason to feel out of place or insecure. We’re here for you. All rates are based upon two adults and two children under age 17. All campsites have electric, water and sewer. 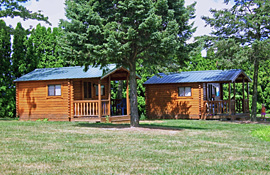 ONE camping unit per site. Check-in is after 2:00PM / Check-out is by 1:00PM. * Monthly rates require a two-month minimum stay. 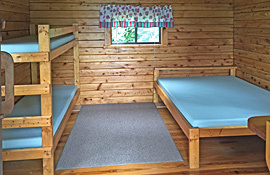 Our cabins accommodate two adults and two children, with one full-sized bed and one set of twin bunks. 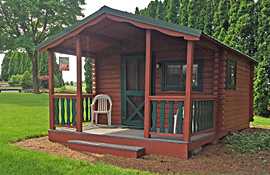 The cabins have one room and a covered porch with two chairs. There is no heat or air conditioning in these rustic, no frills cabins. There is a small fan and a microwave oven. Bring your own linens and pillows. Pay for 6 days and the 7th day is free! Note: We do not currently honor Good Sam, AAA, or travel club discounts. Registered campers are responsible for their guests. They must check-in with the office and park on parking lot. 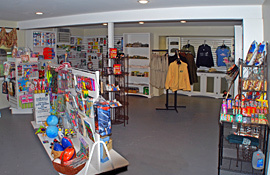 A daily fee of $7.00 per adult and $5.00 per child will be charged on holiday and special event weekends. Visitors must leave the park by 10:00PM. If notice is received 7 days prior to scheduled arrival date, a full refund will be given. No credit or refund for cancellations less than 7 days prior to scheduled arrival or for no-shows. Cancelled reservations will be charged by credit card for the full amount of the reservation. Also, holiday and special event weekends must be cancelled 14 days prior to scheduled date of arrival, or you will be charged the full weekend amount. No refunds for late arrivals, early departures, or inclement weather. Make your Pine Hill RV Park reservation requests online! Simply complete the form below, indicating your dates of arrival and departure, number of people, the type of camping equipment which you will be using, the type of site which you require, and your basic contact information. We will reply promptly to confirm availability and to obtain the necessary deposit.